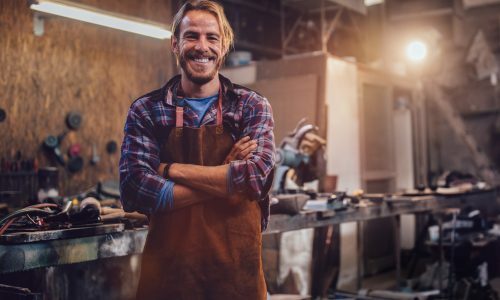 Give your business the best start online with our easy guide to how small businesses can get ahead. Whether you’re looking to take your bricks and mortar business online or are starting a new business from scratch, it’s important to give your brand the best possible beginning. An effective online presence gives local businesses global reach by providing potential customers with vital information, assisting with generating business and helping build relationships, but it can be difficult to get it right. In an effort to empower small businesses with the knowledge they need to thrive online, we recently partnered with Bricks and Clicks, a Channel 7 docuseries hosted by Kochie’s Business Builders. The program featured expert advice from successful entrepreneurs and industry experts alike, the series covered a vast range of topics essential for small business owners, showing them just how much digital can do to help kickstart their brands – and it’s still available to view online. Almost half of Australians won’t consider a business that doesn’t have an online presence. To help you get your business off the ground, we’ve created an easy-to-follow four-step plan, based on key learnings from the Bricks and Clicks series, to help get your business off the ground. Before doing anything else, you’ll need to find your online business a suitable home. Begin by finding a domain name and hosting service, as well as setting up a company email. Your first-choice domain name may already be taken, so check what’s available first. Your domain name will affect your business’ branding, but it isn’t the only consideration. The type of website you need and its look and feel will have an impact on how customers perceive your brand. A professionally designed website will incorporate branding that goes beyond your logo with a consistent look and feel across images, fonts and colour themes. According to a 2018 study, 88 per cent of Australians are active internet users, with 15 million on Facebook alone. Connect with these customers by establishing a strong social media presence. Before doing this, you’ll need to create a social media strategy that stays true to your brand identity. Just as important as getting ahead on social media is getting ahead on Google. You can do this through search engine optimisation (SEO) – which ensures your customers can find you online quickly and easily. Keywords are the building blocks of SEO as they improve the rankings of unpaid search results delivered to potential customers. You can research which ones are the best for your business by using Google’s Keyword Planner, or conduct an audit of your current SEO strategy and implementation by using our free SEO Health Check tool. Offering an informative experience for your customers is key to gaining traction on your website, and the best way to do this is through creating insightful content – whether it’s on your website through a blog or via various social channels. Research the platforms available and discover where your potential customers are spending the most time. Remember that it’s important to focus on key platforms and ensure you’re using them effectively. One or two platforms used really well are better than several used poorly. Finally, it’s essential to do your research and make sure you’re doing everything to industry best practice standards. Algorithms and platforms change every single day, so this can be confusing for busy business owners looking to build the best digital presence possible. “While there are many tools on the market that can create a website, knowing how to digitally market your product and use the internet to drive sales is another story,” agrees Kochie. Make sure you use a reputable provider with experience in your core target market, with a proven track record of helping Australian small businesses start-up successfully. We offer a variety of online marketing and website development services designed to help you thrive while also saving your business time and money. Get up to speed on the digital front with our handy guide to achieving online success, or call our sales team for more information on 1300 638 734.